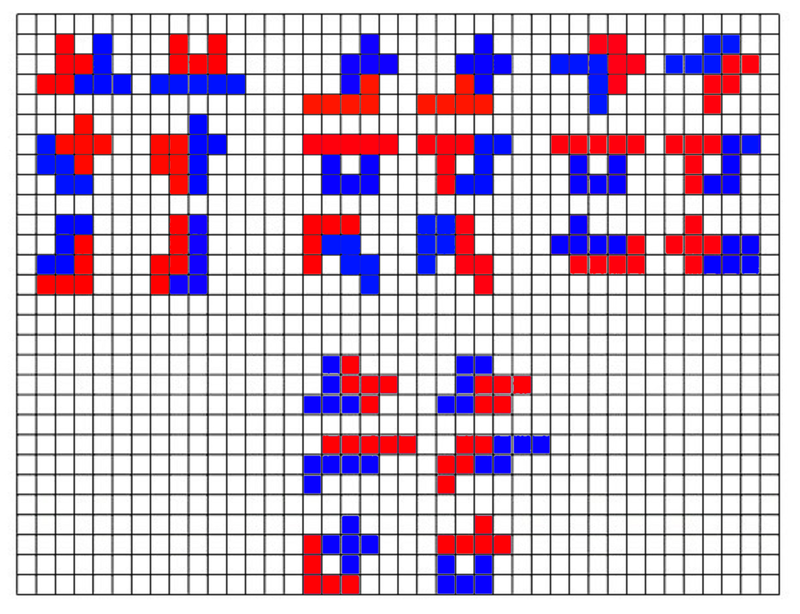 Split the 12 pentominoes into three sets of four. Can you pair up pentominoes so that each set makes two of the same shape? That uses the L, P, F, and U pentominoes, meaning you'd no longer be able to use those in any other sets. Some of those sets have more than one possible way to split them into pairs, but interestingly enough, LN-VZ is the only set of two pairs that can produce more than one final shape! All others have a unique solution. Here's my Python code, if anyone is interested in how I got this. I'm not 100% convinced it's bug-free, so there might be extra configurations beyond the ones shown here. Every set I found needs the U.. quite frustrating. Here is what I got so far, maybe it can be useful to someone until I find more. Not the answer you're looking for? Browse other questions tagged geometry no-computers polyomino or ask your own question.